I made this last year when we had a party and it was so easy and so good. I found it on Pillsbury.com. I've also seen a version of this as an ornament. But I thought I would share this since the holiday entertaining season has officially started! When I made it I changed the veggies up a bit so you can really used whatever you would like. - Heat oven to 375°F. Remove dough from can in 1 long roll; do not unroll or separate. Cut roll into 16 slices. - On ungreased cookie sheet, place slices cut side down to form tree. Start by placing 1 slice for top; arrange 2 slices just below, with sides touching. Continue arranging a row of 3 slices, then a row of 4 slices, ending with a row of 5 slices. Use remaining slice for tree trunk. - Bake 11 to 13 minutes or until golden brown. Cool 1 minute; carefully loosen from cookie sheet with spatula, and slide onto cooling rack. Cool completely, about 15 minutes. - Place tree on serving platter or tray. In small bowl, mix cream cheese spread and milk until smooth. Spread mixture over baked tree. - Cut strips from red bell pepper for garland; chop any remaining red pepper. With small star-shaped canapé cutter, cut star from yellow bell pepper; chop remaining yellow pepper. 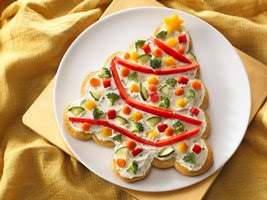 Decorate tree with bell peppers, broccoli, carrots and cucumber. -Serve immediately, or cover loosely and refrigerate up to 24 hours before serving.